The Stubbs Haysaver Rack Back & Top Panels should be added to the Haysaver Wall Rack. 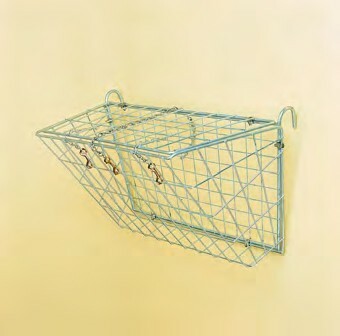 It is a hooked back with a hinged top which covers the spaces in the Haysaver Wall Rack. Also includes safety attachment chain. Hot dip galvanised. Perfect for hanging on a fence or gate. Please Note: The Haysaver Wall Rack (which is shown attached to the back and top panels in the picture) is not included and needs to be ordered separately. There are currently no questions for Stubbs Haysaver Rack Back & Top Panels - be the first to ask one!